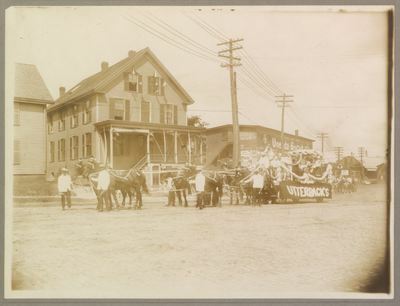 "Utterback Brothers Co. Bangor Carnival Parade Float, June 18, 1912"
"In striking contrast to the delicacy [of the Siegel-Sanders Co. float] was the big float of Utterback Brothers, which was labelled The Passing of the Horse, which was literally true. Drawn by six black horses, each led by a restraining groom as black as the animal itself, was the famous Utterback horse in white, harnessed to a basket carriage occupied by some happy, bright faced children." Utterback Brothers Co. was John G. (president) and James and Edgar (clerks). Located at 46 Broad Street, the company was a carriage and sleigh dealer. Bangor Carnival 1912, Bangor Maine history, Utterback Brothers Co.